37 Marlborough was built ca. 1869, one of three contiguous houses (35-37-39 Marlborough) built at about the same time. 37 and 39 Marlborough are mirror opposite buildings, with a shared central entrance porch which creates a symmetrical entryway. 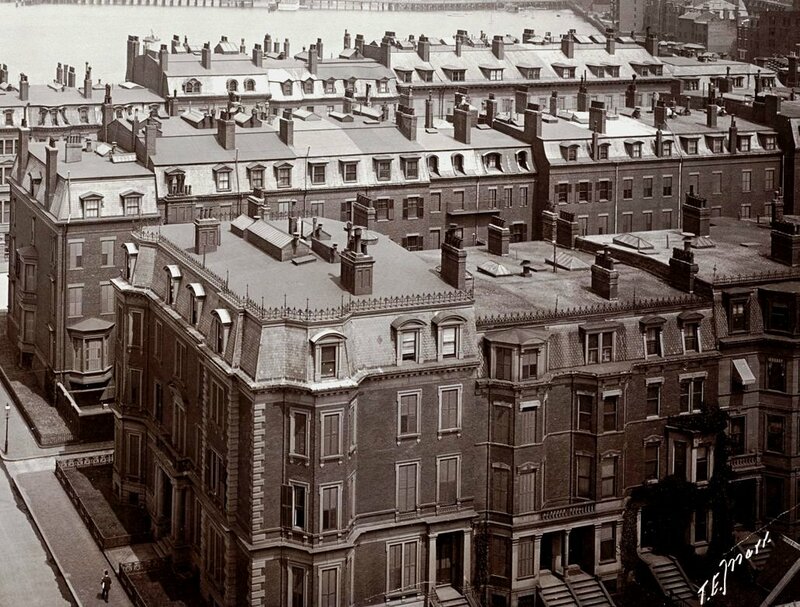 Photographs from about 1900 show that the bay of 37 Marlborough stopped at the cornice line and there was a dormer in the mansard roof, whereas the bay of 39 Marlborough extended to the top floor. This may have been the original design, or the top floor bay at 37 Marlborough may have been removed and replaced by the dormer. 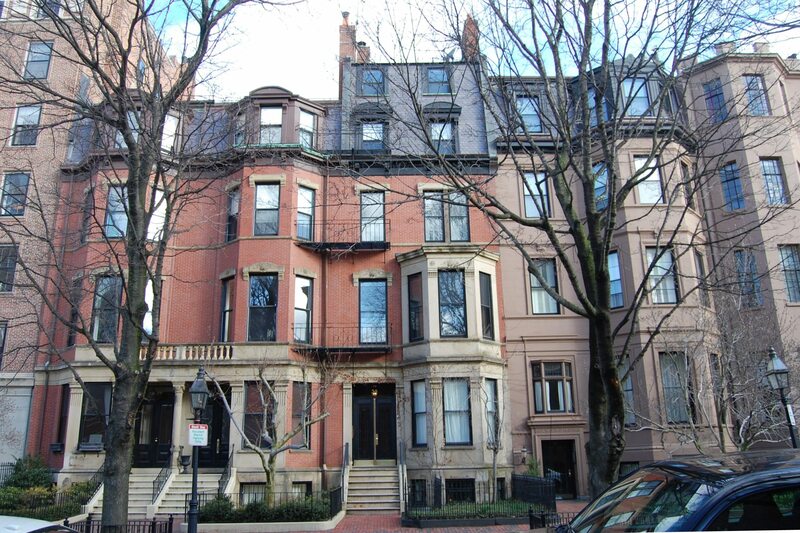 In October of 2000, the Back Bay Architectural Commission concluded that the latter was more likely and permitted replacement of the dormer with a bay matching the bay at 39 Marlborough. At the same time, the Commission also allowed the owner to construct a garage ell at the rear, in the same location as an ell that may have been part of the original house and had been removed at some point. Click here for an index to the deeds for 37 Marlborough. On October 29, 1869, 37 Marlborough was purchased from Charles Freeland by Dr. Alexander Thomas, a physician. He and his wife, Margaret Atwood (Williams) Thomas, made it their home. They previously had lived in Dorchester. Margaret Thomas died in December of 1872, and Alexander Thomas died in January of 1874. By 1875, it was the home of Margaret Thomas’s sister, Miss Sarah Isabella Williams, who probably assumed responsibility for raising the Thomases’ two small children, Anna Buckminster Thomas and Rufus Kemble Thomas. By 1880 (and probably before), they were joined by another sister, Miss Susan A. B. Williams. Susan Williams continued to live at 37 Marlborough until her death in November of 1902. Rufus Thomas was a stockbroker and lived there until 1908, when he joined the United Fruit Company and went to Costa Rica. Sarah WIlliams died in 1919, and Anna Thomas moved soon thereafter to the Hotel Ludlow (southwest corner of Clarendon and St. James). 37 Marlborough continued to be owned by the estate of Alexander Thomas. During the 1919-1920 winter season, it was the home of retired investment banker, Harry Kent White, and his wife, Nora Bartley (Kent) White. They previously had lived in an apartment at 186 Commonwealth. They also maintained a home in Pepperell, Massachusetts. By 1921, they had moved to 393 Marlborough. During the 1920-1921 winter season, it was the home of Matthew Luce and his wife, Mary Cobb (Hovey) Luce. He was a wool merchant. They previously had lived The Chesterfield at 371 Commonwealth. They had moved by the next season, and by the 1922-1923 season were living at 267 Beacon. By the 1921-1922 winter season, 37 Marlborough was the home of Rev. Charles Russell Peck, an Episcopal minister, and his wife, Helen (Peabody) Peck. In 1921, he had been Pastor of the Church of the Redeemer at 928 East Fourth in South Boston, where they also had lived. They moved to 37 Marlborough when he became Assistant Rector of St. Paul’s Cathedral on Tremont. 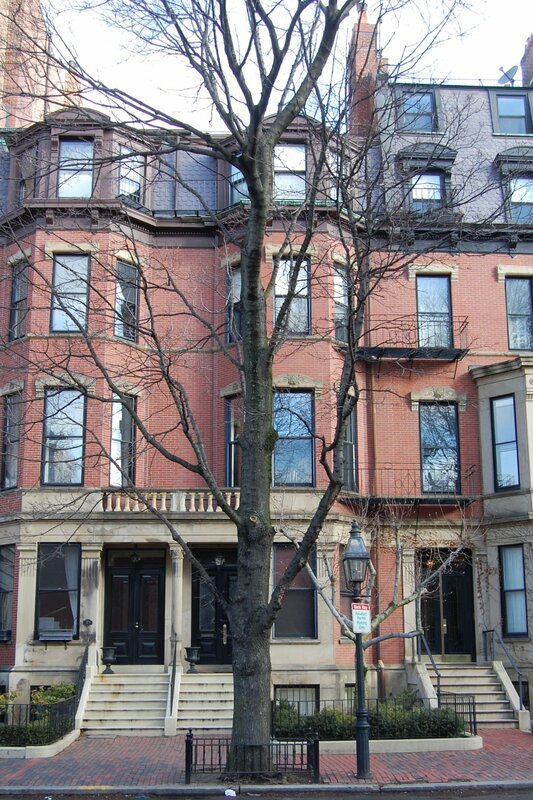 They continued to live at 37 Marlborough in 1924, but had moved to 18 Charles River Square by 1925. By the 1924-1925 winter season, 37 Marlborough was the home Dr. George Colket Caner and his wife, Mary Russell (Paul) Caner. They had married in June of 1924, and 37 Marlborough probably was their first home together. 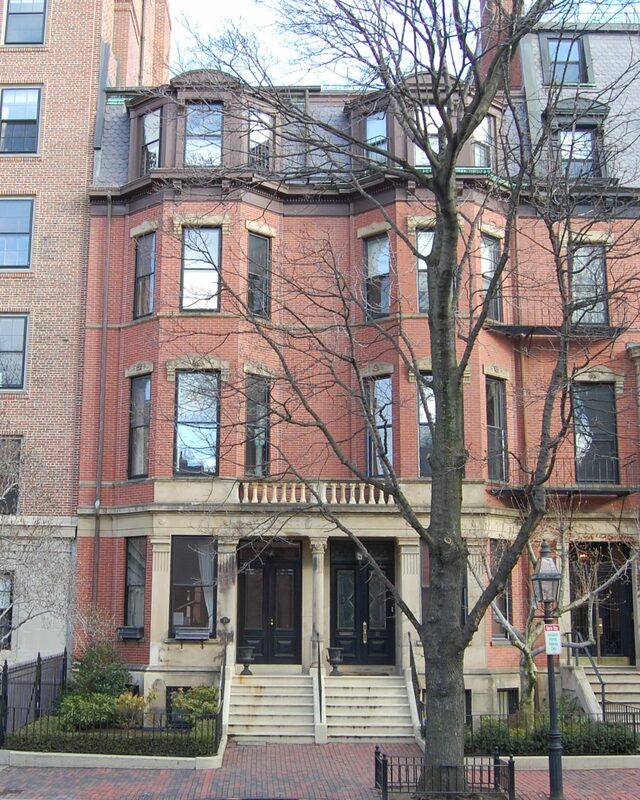 G. Colket Caner was a neurologist and psychiatrist, and maintained his medical offices at 37 Marlborough. He also was an internationally-known tennis player, an American Intercollegiate singles champion and a competitor at Wimbledon, where he and Don Mathey introduced the steel-strung and steel-framed tennis racquet in 1922. 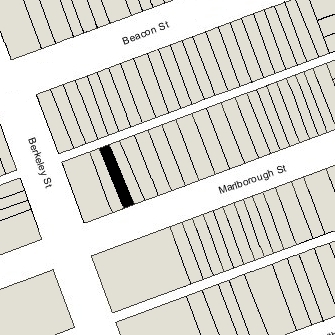 Dr. and Mrs. Caner continued to live at 37 Marlborough in 1927, but had moved to 63 Marlborough by 1928. 37 Marlborough was not listed in the 1928 Blue Book. By the 1928-1929 winter season, it was the home of Dr. Worcester Randolph Angell, a physician, and his wife, Helen N. (Hogg) Potter Angell. They previously had lived at 84 Commonwealth. By 1930, they lived in Arlington. By the 1929-1930 winter season, 37 Marlborough was the home of real estate broker John W. Dunlop and his wife, Alice L. (Hall) Dunlop. They previously had lived in Brookline. They also maintained a home in Marblehead. They continued to live at 37 Marlborough until about 1932, but had moved to 83 Chestnut by 1933. 37 Marlborough was shown vacant in the 1933 and 1934 City Directories. By 1935, it had been converted primarily into medical offices, with one or two lodging units. From about 1937, among the physicians who maintained their offices at 37 Marlborough was Dr. John H. Taylor. He and his wife, Eleanor Sherburne (Sanger) Taylor, lived in Cambridge. From about 1941, Dr. Frank C. d’Elseaux also maintained his offices there. He was a psychiatrist and previously had been senior physician at the Boston Psychopathic Hospital. He and his wife, Virginia (Gay) d’Elseaux, lived in Winchester. On October 9, 1945, the estate of Alexander Thomas transferred 37 Marlborough to Rufus K. Thomas, and on the same day it was purchased from him by John and Eleanor Taylor and Frank and Virginia d’Elseaux, each couple with a one-half undivided interest. Dr. Taylor and Dr. d’Elseaux continued to maintain their offices there and to lease offices to others. John Taylor died in September of 1964, and on November 23, 1964, Virginia d’Elseaux acquired the Taylors’ interest in 37 Marlborough from Eleanor Taylor. On December 7, 1964, Frank d’Elseaux transferred his interest in the property to his wife. Dr. d’Elseaux continued to maintain his office at 37 Marlborough until about 1968. By that time, they were living in Marblehead. On May 9, 1968, 37 Marlborough was purchased from Virginia Gay d’Elseaux by Dr. William Franklin, a physician, and his wife, Beverly R. Franklin. They converted the property into three apartments, one of which they made their home. On September 21, 2000, 37 Marlborough was purchased from the Franklins by Frontgate LLC. In November of 2000, they applied for (and subsequently received) permission to convert the property back into a single-family dwelling, significantly remodeling it, including adding the top story bay in the front (to match the bay at 39 Marlborough), and adding an ell at the rear for use as a garage. The property changed hands. It remained a single-family dwelling in 2015.